Commuters and residents are being warned about the following disruptions to traffic today, Thursday, February 26, in and around Derbyshire. There is slow traffic on the A52 Brian Clough Way inbound in Derby at Pentagon Island. There is slow traffic on the A38 southbound in Derby at Markeaton Island. There is stop-start traffic on the M42 southbound between J11, A42 (Burton-Upon-Trent) and J10, A5 (Tamworth). Abbey Street in Derby is closed in both directions between the Spa Lane junction and the A5250 Burton Road junction, because of water main work. Diversion in operation. Expect delays. There are temporary traffic lights on the A6135 Sheffield Road in Barlborough at the Low Common junction. There are temporary traffic lights on the A619 Chatsworth Road in Brampton, Chesterfield, at the Somersall Lane junction. There is bridge maintenance work on the A619 Markham Road in Chesterfield at the Queens Park footbridge junction. There is gas main work and temporary traffic lights on the A515 at Brierlow Bar between the B5053 Buxton Road junction and the Upper Blindlow Lane junction. There are temporary traffic lights on the A61 Derby Road in Wingerworth between the Nottingham Drive junction and the Longedge Lane junction. Spinkhill Road in Spinkhill is closed in both directions between the Green Lane junction and The Avenue junction, because of roadworks. There is water main work and temporary traffic lights on the A5250 Burton Road in Littleover, Derby, between the Whitaker Road junction and the Swinburne Street junction. There are temporary traffic lights on the A61 Main Road in Higham, Alfreton, between the Well Lane junction and the B6013 junction. Expect delays. There are temporary traffic lights on the A632 Lime Tree Road in Matlock between The Limes Close junction and the Lynholmes Road junction. There are temporary traffic lights on the B5023 Derby Road in Ashleyhay, Wirksworth, near the Alton Manor Farm junction. There are temporary traffic lights on the B5470 Manchester Road in Chapel-en-le-Frith between the Crossings Avenue junction and the Long Lane junction. There are temporary traffic lights on Long Lane in Chapel-en-le-Frith between the Cromwell Avenue junction and the B5470 Manchester Road junction. There are temporary traffic lights on the B6179 Chapel Street in Ripley between the Greaves Street junction and the B6441 Church Street junction. There are temporary traffic lights on St Augustines Road in Chesterfield at the St Augustines Crescent junction. Walbrook Road in Normanton, Derby, is closed in both directions between the Brunswick Street junction and the Stenson Road junction, because of sewer works. Derby Lane in Normanton, Derby, is closed in both directions between the Lawrence Street junction and the Stenson Road junction, because of sewer works. 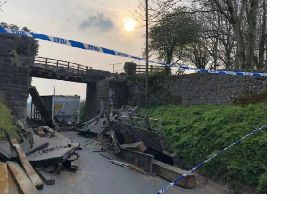 Main Street in Little Longstone is closed in both directions between the Monsal Head junction and the Butts Road junction, because of water main work. Marsh Lane in Furness Vale is closed in both directions between the Station Road junction and the Ladypit Road junction, because of sewer works. There is water main work and temporary traffic lights on the B6049 eastbound in Miller’s Dale between the Long Lane junction and the Meadow Lane junction. Beech Avenue in Alvaston, Derby, is closed in both directions between the Kelmoor Road junction and Blue Peter Island, because of roadworks. Diversion in operation - via Walnut Ave, Elvaston Lane and Shardlow Rd. Arrive Derby buses 44 and 45 are on diversion. There are temporary traffic lights on Eccles Road in Chapel-en-le-Frith near the Cross Street junction. There are temporary traffic lights on the B6016 The Green in Swanwick at the High Street junction. Resurfacing work is taking place on King Street in both directions in Belper Town Centre between the Strutt Street junction and the A609 Market Head junction. Expect delays. There are temporary traffic lights on Wilmore Road in Sinfin, Derby between the Merrill Way junction and the Rolls Royce Gate 6 junction. Jagger’s Lane in Hathersage is closed in both directions between the Coggers Lane junction and the A6187 Main Road junction, because of water main work. There is water main work and temporary traffic lights on Conksbury Lane in Youlgreave between the Alport Lane junction and the Coalpit Lane junction. There are temporary traffic lights on Coach Road in Butterley between the Falkirk Avenue junction and the B6179 Butterley Hill junction. There are temporary traffic lights on Brookside Road in Breadsall, Derby at the Brookfields Drive junction. Cheviot Street in Derby is closed in both directions between the New Zealand Square junction and the Mackenzie Street junction, because of sewer works. Longedge Lane in Wingerworth is closed in both directions between the Lodge Drive junction and the A61 Derby Road junction, because of gas main work. There are temporary traffic lights on Callywhite Lane in Dronfield near the Cliffe Park junction. There are temporary traffic lights and sewer works on Stenson Road in Normanton, Derby at the Upper Dale Road junction. Diversion in operation - Arriva Derby buses 33, 33A, 36, 36A and 37 will be disrupted. Expect delays.